Who doesn't like ice-cream?! Alpha from Dr Fog's Famous Ice Cream is fruity special, characterised by a tropical Watermelon Sherbet ice-cream taste. Area 51 from Decoded is a definitive citrus fruit vape, consisting of Mangoes, Lychees, and Papaya. Berry Blast by Front Line Liquids is a flavour blend of all things Berry-related, featuring a balanced blend of Mixed Berries. An intense blackcurrant flavour and freshness that will satisfy every taste. A tangy Grape flavour on the inhale with a refreshing hint of mint that will enliven your senses. 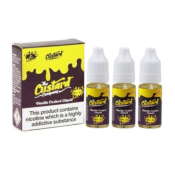 This is a beautifully crafted Vanilla Custard brought to you by The Custard Company.